Steam, a popular digital distribution, digital rights management, multiplayer and communications platform for games and related media developed by Valve Corporation, has been made available to users of Mac OS X system. The Steam client for Mac OS X is officially made available for free download on May 12th, 2010, after Valve teased the Mac community with images featuring Valve game characters with Apple logos or in parodies of old Macintosh advertisements. The availability of Steam client on Mac platform likely to satisfy one of the main frustration on Mac system, i.e. lack of quality game titles. Though not all games available on Steam is playable on Mac, the debut of Steam on Mac operating system does accompanied by tens of games available immediately, with the list growing everyday including native Mac OS X and OpenGL versions of Left 4 Dead, Left 4 Dead 2, Team Fortress 2, Counter-Strike: Source, Portal, and the entire Half-Life series due to be released in future. 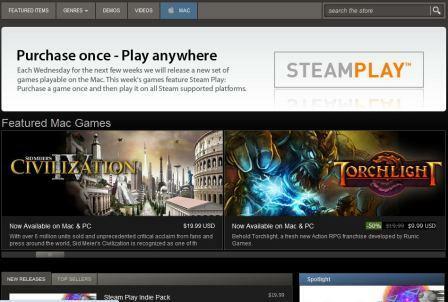 With the availability of Steam client for Mac, Steam also introduces Steam Play. SteamPlay allows players and gamers who have already purchased compatible products in the Windows version to re-download the Mac versions at no cost, and vice-versa. Note that not all games are in Steam Play list though, and some game titles does require user to purchase Windows and Mac versions separately to gain the cross-platform functionality. The Steam Cloud is Windows and Mac cross-platform compatible, so does multi-player games, allowing Windows and Mac players to play with each other. Portal 2, due by the end of 2010, will be simultaneously released on both the Windows and Mac versions of Steam. As a special promotion, Valve and Steam are offering Portal for Windows and Mac for free until May 24th, 2010. For Mac OS X who encounters Steam requires that Applications/Steam.app/Contents/MacOS be created on a case-insensitive file system, with read-write access error, here’s the workaround to install Steam on case-sensitive file system.